One of the challenges of medicine, in so far as it is a body of accumulated knowledge, is turning practices into words in order to preserve them. In some areas of medicine, the words themselves are the practice: the classification of disease (nosology), for example, or anatomy are captured in the precision of their vocabulary. But for surgery – the “work of the hand” (chir- [hand] + urgos [work]) – a written text is secondary: an attempt to fix in writing actions generated by the hand, eye, and brain working in concert. Still, the written tradition has its role in the accumulation of surgical knowledge across generations. But when a written tradition is disrupted, how do you restart it? Early medieval Europe witnessed such a disruption when the rich ancient tradition of surgical writing was effectively lost. Most ancient surgical texts were written in Greek, and when these failed to be translated into Latin as the old Roman Empire fell apart, the learning they embodied effectively disappeared. A work like Aulus Cornelius Celsus’s Latin De medicina (On Medicine), which addressed surgical procedures in Books V-VIII, carried forward practices recorded (but probably not performed) by that first-century Roman patrician. But we have little evidence that the four manuscripts of Celsus that survived in early medieval monastic houses were consulted, save for some interest in cautery. Indeed, the value of Celsus’s work for surgery seems not to have been realized until it was incorporated into a large Latin surgical compendium, written in London in around 1400. Empirical practices of surgery no doubt continued in early medieval Europe, particularly in urban communities large enough to support some medical specialization. But it is significant that the word “surgeon” disappears as a professional label in the early Middle Ages. We know of quite a few medici (healers), but no one who identifies as doing the special work of the hands. There are a few chapters on surgery in a work called the Introductio sive Medicus (The Introduction, or The Physician), but there is only one extant copy and little reason to think that that truncated text could have informed any aspiring surgeon. A few fragments that went under the name of Heliodorus, a well-known surgeon and contemporary of Trajan, transmitted a list of the technical names of various surgical tools. But the words were so garbled as to be useless. An exception may have been the transmission of lore about medicinal preparations to be used as aids in surgical practice. The monastery of Monte Cassino, the motherhouse of the Benedictine monastic order, had the distinction of not simply preserving, but competently editing older medical texts in its holdings. A late 9th-century manuscript still in its collection transmits a recipe for a “soporific sponge,” a sponge infused with opium, mandrake, hemlock, and henbane that, when used as an inhalant, was intended to “allow the sleeper to feel no pain while being cut.” The latter recipe in particular, together with a variety of recipes for unguents and salves, is evidence for the continuity of surgical care, which would always have been necessary given the inevitability of wounds. The inevitability of obstetrical difficulties is also acknowledged by adaptations of Muscio’s Gynecology (fig. 1), another work that Monte Cassino had in its collection, though the omission of more aggressive surgical procedures is notable. Fig. 1: Two of the sixteen fetus-in-utero figures from a copy of Muscio’s Gynecology, a Latin text composed in the fifth or sixth century, here in a manuscript made in the 12th century from an original held by the Abbey of Monte Cassino. The images were meant to help the midwife visualize the ways the fetus might malpresent at birth; the first shows a normal head-first presentation, while the second shows feet-first which demanded intervention. Vatican, Biblioteca Apostolica Vaticana, MS Pal. lat. 1304, late 12th cent., f. 83r. The general barrenness of the surgical landscape in early medieval Europe disappeared quite suddenly between the later 11th and the later 12th century when four new Latin surgical texts came into being. One arose out of a continuous written tradition that stretched back to the ancient Greek world, another out of empiricism that captured local Italian practices. The third and fourth show fusions of the learned and the empirical, creating a new, uniquely European tradition of medical writing. The earliest surgical text in this period was an import from the Islamic world. Sometime in the 1070s, an immigrant from Tunisia arrived in southern Italy, bearing with him a cache of Arabic medical texts. Constantine the African proceeded to Monte Cassino and spent the rest of his career there as a monk, drawing on the rich library of medical texts the abbey had already accumulated to translate his Arabic texts into Latin. One of these he called the Pantegni, “the whole art.” Composed originally by a Persian physician, ‘Ali ibn al-‘Abbas al-Majusi (d. 936), the Arabic Kitab Kamil as-Sina’a at-Tibbiyya (“Book of the Whole Art of Medicine”) did indeed encompass the whole art, laying out all aspects of theory and practice in 20 long books. Fig. 2: Opening of Constantine the African’s Surgery. Bethesda, Maryland, National Library of Medicine, MS NLM E 8, ca. 1145 (England), f. 149r (detail). Courtesy US National Library of Medicine. The surviving chapters offered a definition of surgery, the third branch of medical practice after diet and drugs, followed by sections on therapeutic and prophylactic phlebotomy, and then the treatment of conditions on or near the surface of the body moving from the head down. So the text covered the eyes, polyps in the nose, tumors of the neck, to removing excess fat from male breasts, drawing off fluid accumulation of patients with dropsy, and repairing intestines that extruded when caused by a wound to the belly. But so many other topics—from broken bones and dislocations to obstetrical interventions to cautery techniques and hernia treatments—were lost. Perhaps written in ignorance of Constantine’s work was a second, very brief Latin surgical text, called simply the Chirurgia Salernitana (Salernitan Surgery). It emphasizes the kind of mundane surgical concerns that were missing from Constantine’s (incomplete) text: wounds to the head, dislocated or broken bones (both extruding and not), burns whether by fire or (boiling) water. It uses a very simple vocabulary—plaga, “blow,” rather than vulnus, “wound.” And it uses very simple, even household ingredients: wine, eggs, burnt felt, the feathers of a hen. Corrosive powders and soothing unguents are about the extent of the polypharmacy it employs. That it should directly follow Constantine’s incomplete Surgery in one of its four extant copies suggests how complementary the two works would have seemed. The knowledge that a fuller version of al-Majusi’s surgical book existed in Arabic seems to have induced an active hunt for the text, a hunt rewarded between 1113 and 1115 when, during a prolonged campaign by allied Barcelonan and Pisan forces to retake the Balearic Islands from Muslim control, one “John the Saracen” and Rusticus of Pisa obtained a new copy of al-Majusi’s text and, together, completed the translation of the surgical book that Constantine the African had started. Only two copies of the original version of John and Rusticus’ translation have survived to the present day, but by the middle of the 12th century it facilitated the creation of another new surgical text, now called the Bamberg Surgery, from the library where the text was first discovered by Karl Sudhoff towards the beginning of the 20th century. It was analyzed again in the 1930s by George Washington Corner (1889-1981), a name still well known in medical circles as a leading embryologist and birth-control pioneer, who was also deeply interested in the history of anatomy. He studied the Bamberg Surgery in close detail from a copy owned by his colleague, the neurosurgeon Harvey Cushing (1869-1939), which is now part of the Harvey Cushing/John Hay Whitney Medical Library at Yale University (fig. 3). Fig. 3: Opening of the Bamberg Surgery. New Haven, Yale University, Harvey Cushing/John Hay Whitney Medical Library, MS 10, 2nd half of the 12th cent., f. 26v. Courtesy of the Harvey Cushing/John Hay Whitney Medical Library. The Bamberg Surgery doesn’t get a lot of love in histories of surgery, because of its patchwork character. As Corner himself said, “it is a notebook, a partially organized collection of notes, memoranda, prescriptions, and excerpts from other books.” But the Bamberg Surgery merits a closer look to contemplate the question with which we began: how do you begin to build up a body of written surgical knowledge when previously you had none? The Bamberg Surgery draws selectively from the (now complete) translation of al-Majusi’s text, which it fuses with an early medieval text on phlebotomy that circulated under Hippocrates’ name. It then expands on these elements with new pharmaceuticals, new techniques, and elements of anatomical and physiological learning drawn from other texts. For example, al-Majusi’s text had never mentioned marciaton, a compound medicine for a wax-based unguent passed on through the early medieval Latin pharmaceutical tradition. The Chirurgia salernitana had recommended its use, and we find it in the Bamberg Surgery likewise, being recommended for nerve damage from a wound, broken bones, and dislocations. Fig. 4: An additional soporific recipe, added by a later reader of New Haven, Yale University, Harvey Cushing/John Hay Whitney Medical Library, MS 10, f. 38v. Ciphers were used to disguise the key ingredients: mandrake, henbane (hyoscyamus), and lovage (levisticum). It has been argued for a later period that surgical writing begets more surgical writing, as new readers become authors themselves by reacting to the texts of their predecessors and incorporating new insights they have had. I think a similar claim can be made for developments in surgical writing in the 12th century. The Bamberg Surgery was followed (and superseded) by the 4th surgical work of the period, the Surgery of Roger Frugardi, our first named surgical writer, who was also working in southern Italy. In contrast to the Bamberg Surgery, which survives in only ten copies, Roger’s Surgery survives in at least 45 Latin copies. It was, moreover, translated in the following centuries into Occitan, Anglo-Norman, French, Italian, German, Hebrew, and Catalan, in each language serving to train generations of surgeons, many of whom didn’t engage with the Latin learning of the universities, but who nevertheless wished (or needed) to demonstrate their learning in their chosen profession. A famous illustrated copy of the Anglo-Norman translation of Roger’s text (fig. 5), made in the 13th century in England, gives us a sense of the social stature that such learned surgeons might enjoy. But Roger’s text, which runs to more than twice the length of the Bamberg Surgery and addresses many more surgical conditions, could not have been written were not he, too, building on a tradition whose foundations had already been laid. Fig. 5: Cambridge, Trinity College, MS O.1.20, 13th century, f. 243r, a surgeon reading instructions to test for cranial fracture, the signs of which include a swollen head. From a sequence of images drawn into the lower margins of an Anglo-Norman translation of Roger Frugardi’s Surgery. It cannot be said that Europe in the 11th and 12th centuries created a tradition of surgical writing “from scratch.” Constantine the African’s conveyance of al-Majusi’s work from Arabic was a catalyst, and as we have seen, the completion of that translation was crucial for the full development of an indigenous Latin tradition of surgical writing. We can only imagine how far European surgery would have developed beyond the state of the Chirurgia Salernitana had it not had that key infusion of Arabic surgical learning. But after the foundation was laid, Italian surgical writers took the initiative to comb through and rethink the written tradition they had inherited. The Bamberg Surgery is indeed a “notebook,” a text that captures the rough thinking of a practicing surgeon, trying to synthesize the knowledge he has gained from his own hands with the written knowledge of generations of surgeons before him. Monica H. Green (monica.green@asu.edu; @MonicaMedHist) is currently a visiting Fellow at the American Academy in Berlin, where she is working on a book tentatively entitled The Global History of Health. She would like to thank Melissa Grafe at Yale University’s Harvey Cushing/John Hay Whitney Medical Library, and Stephen Greenberg of the National Library of Medicine, for kindly supplying photographs of manuscripts in their collections. A text with the title Liber cyrurgie Ypocratis (“Hippocrates’ Book on Surgery”) opens with an excerpt defining surgery taken from Celsus’s Book VII. But the only type of surgery it shows any interest in is cautery, whose practices were supposed to be illustrated in the blank spaces left in the manuscript. A reproduction of the manuscript (Paris, Bibliothèque Nationale de France, MS lat. 7028, s. ix), can be consulted here: http://gallica.bnf.fr/ark:/12148/btv1b9067090j/f172.image. Oxford, Bodleian Library, MS Laud. misc. 724, ca. 1400 (London), brings together the surgical writings of al-Zahrawi (in the Latin translation by Gerard of Cremona); 14 scenes of a male practioner making and using cautery tools and a female practitioner applying cupping glasses, followed by the fetus-in-utero figures from Muscio’s Gynecology; Roland of Parma’s Surgery (composed ca. 1230); Book IX on surgery from Constantinus Africanus, Pantegni Practica; and Books V-VII of Celsus, De medicina. For more on this important surgical collection, see Monica H. Green, “Moving from Philology to Social History: The Circulation and Uses of Albucasis’s Latin Surgery in the Middle Ages,” in Between Text and Patient: The Medical Enterprise in Medieval and Early Modern Europe, ed. Florence Eliza Glaze and Brian Nance, Micrologus’ Library, 30 (Florence: SISMEL/Edizioni del Galluzzo, 2011), pp. 331-72. Clare Pilsworth, Healthcare in Early Medieval Northern Italy: More to Life Than Leeches? (Turnhout: Brepols Publishers, 2015). The text, call the Introductio sive Medicus (“The Introduction, or The Physician”) is a Latin translation of an ancient Greek text. It is found uniquely in Karlsruhe, Badische Landesbibliothek, Cod. Aug. perg. 120, available in full digital facsimilie here: http://digital.blb-karlsruhe.de/blbhs/content/titleinfo/64141 . See also Caroline Petit, “The Fate of a Greek Medical Handbook in the Medieval West: the Introduction, or the Physician ascribed to Galen,” in Medical Books in the Byzantine World, ed. Barbara Zipser, Quaderni Bolognesi di Filologia Classica, Studi Online, 2 (Bologna: EIKASMOS, 2013), pp. 57-78. Henry Sigerist, “Die ‘Cirurgia Eliodori’,” Archiv für Geschichte der Medizin 12 (1920), 1-9; ibid., “Die ‘Lectiones Heliodori’,” Archiv für Geschichte der Medizin 13 (1921), 145-56. Monte Cassino, Biblioteca della Badia, Cod. Casin. lat. 69, p. 6; cf. Karl Sudhoff, “Zu den Schlafschwämmen der Borgognoni,” Archiv für Geschichte der Medizin 13, no. 3/4 (July 1921), 127-28. On the history of the soporific sponge and other surgical soporifics, see Linda E. Voigts and Robert P. Hudson, “A drynke þat men callen dwale to make a man to slepe whyle men kerven him: A Surgical Anesthetic from Late Medieval England,” Health, Disease and Healing in Medieval Culture, ed. Sheila Campbell, Bert Hall, David Klausner (New York: Palgrave MacMillan, 1992), 34-56. 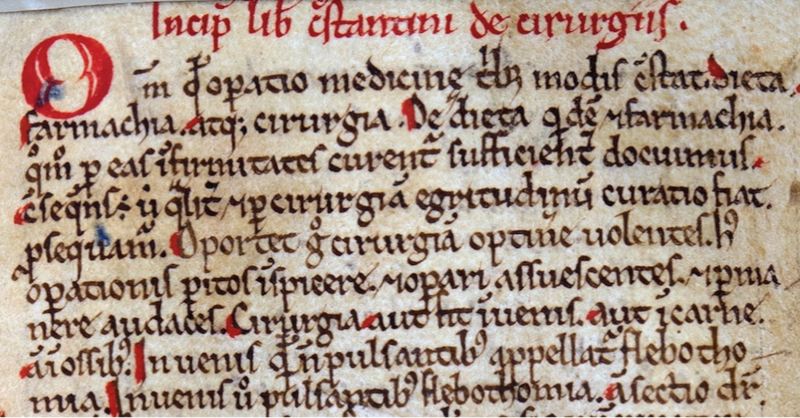 The earliest extant copy of the Chirurgia Salernitana is actually found in a manuscript produced in England: Oxford, Corpus Christi College, MS 189, s. xii2/4, ff. 77va-78vb. On the rapid movement of southern Italian medicine to Norman France and England, see Monica H. Green, “Rethinking the Manuscript Basis of Salvatore De Renzi’s Collectio Salernitana: The Corpus of Medical Writings in the ‘Long’ Twelfth Century,” in La ‘Collectio Salernitana’ di Salvatore De Renzi, ed. Danielle Jacquart and Agostino Paravicini Bagliani, Edizione Nazionale ‘La Scuola medica Salernitana’, 3 (Florence: SISMEL/Edizioni del Galluzzo, 2008), 15-60. Karl Sudhoff, “Die Bamberger Chirurgie aus Salerno in einer Handschrift des 12. und einer des 13. Jh.,” Beiträge zur Geschichte der Chirurgie in Mittelalter 2 (Leipzig, 1918), 103-47; this includes an edition of the Latin text. Although Corner knew that al-Majusi’s surgery was translated in two separate campaigns (he cited the 1906 edition of the John-Rusticus version in his own 1927 study on Salernitan anatomical texts), he didn’t reckon with the significance of that fact when assessing the composition of the Bamberg Surgery in 1937. Translated George W. Corner, “On Early Salernitan Surgery and Especially the ‘Bamberg Surgery’, with an Account of a Previously Undescribed Manuscript of the Bamberg Surgery in the Possession of Dr. Harvey Cushing,” Institute of the History of Medicine, Bulletin, 5 (1937), 1-32. Michael McVaugh, The Rational Surgery of the Middle Ages, Micrologus’ Library 15 (Florence: SISMEL, Edizioni del Galluzzo, 2006). Ah, so why do I call the anonymous author of the Bamberg Surgery “him”? 25 years of research on women’s medicine and medical practitioners in southern Italy in this period make me doubtful that a woman would have been this engaged in literate traditions of medicine. See my analysis of the gendering of medicine in Monica H. Green, Making Women’s Medicine Masculine: The Rise of Male Authority in Pre-Modern Gynaecology (Oxford: Oxford University Press, 2008), especially chapter 1. But I may yet be proven wrong!